NETBALL IS A UNIQUE SPORT WHEREBY EVERY TEAM HAS THE OPPORTUNITY TO HAVE THE BALL AN EQUAL AMOUNT OF TIME. Centre passes alternate which means regardless of what happens once a team has the ball, the rule of the centre pass means all is (or should be) equal. So which quarters have the most centre passes? Does the first quarter have the least because this is when every player is fresh therefore more defensive pressured is being applied? Are there more centre passes in the second half as defence tires? Based on the first five rounds of the Suncorp Super Netball season, centre passes are virtually the same across all quarters with a slight spike in the 4thquarter. Quarter One and Quarter Three have had the least number of centre passes with 540. This equates to a 27.0 per quarter (1.8 centre passes per minute). This makes sense as both sides would at their freshest. Quarter Two is only marginally higher with a total of 544 centre passes which equates to 27.2 per quarter (1.81 per minute). Quarter Four has had 562 centre passes, an average of 28.1 (1.87 per minute) which once again makes sense. Players are getting tired, both sides would be having one last big push to score goals as the game is on the line and scoreboard pressure is at its highest. The Giants v Fever match in Round Two has had the highest amount of centre passes with 120. The score was 66-51 to the Giants (117 goals scored). This game had two centre passes every minute. Quarter Four in the Round Three clash between the Magpies and the Giants has had the highest with 37. This equates to 2.47 centre passes every minute. The score was 17-19 (36 goals scored). 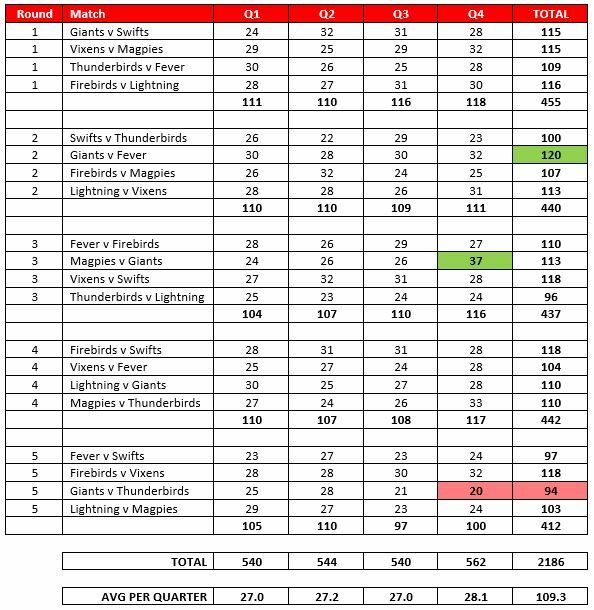 The Giants v Thunderbirds in Round Five had the lowest in a quarter and the lowest in a game. The 4th quarter had only 20 centre passes for only 1.3 every minute. The score was 13-6 (19 goals scored). This game had 94 centre passes for the entire match (1.6 per minute) (91 goals scored). Round One had the most centre passes with 455 and Round Five had the least with 412. Quarter Two is the quarter where the pace of the game, scoreboard pressure and defensive efforts are virtually the same in all rounds. Two rounds have had 110 centre passes with the other two having 107. Score board pressure is at its highest in quarter four. So no matter what the score is, be comfortable in the fact that your team will have an equal chance to score goals as their opposition.